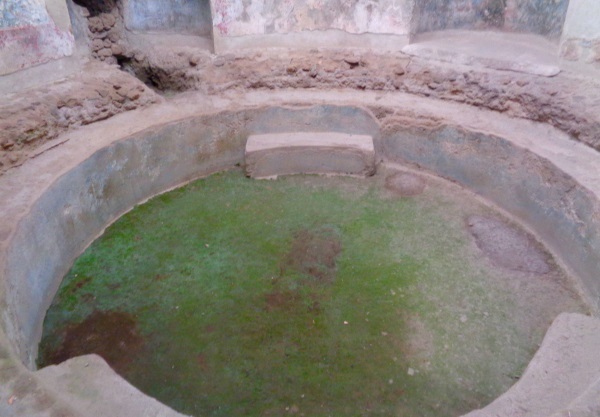 As in all Roman cities, there were thermal baths in Pompeii. These are something like public baths. They had mostly pools with warm water, pools with cold water, also a kind of sauna and a gym, thus an antique fitness studio. The pools were not as big as swimming pools today. They were more for bathing, not for swimming. Men and women were usually separated. There were also, as today, changing rooms. In an adjoining room there was usually an oven that produced the warm water and hot air. The Stabian thermal baths: A large complex, one of the most important sights in Pompeii today. Central Thermae: These large and most modern thermal baths were still under construction during the eruption of the volcano in 79 A.D. and were therefore never completed.